Workshops, art lessons, studios and more! Workshops, lessons, studios and more! Please see the Website for all class details! With Hi-Sook Baker. Watercolour paint is a flexible medium that can generate a variety of visual effects. Under the guidance of Artist Instructor Hi-Sook Baker, you will learn to manipulate this methodic medium to create a glowing impressionistic landscape painting inspired by our great Canadian outdoors! Check out their workshops and programmes! The cost for 3 hours sessions in Life Drawing is $18. and Still Life is $15. 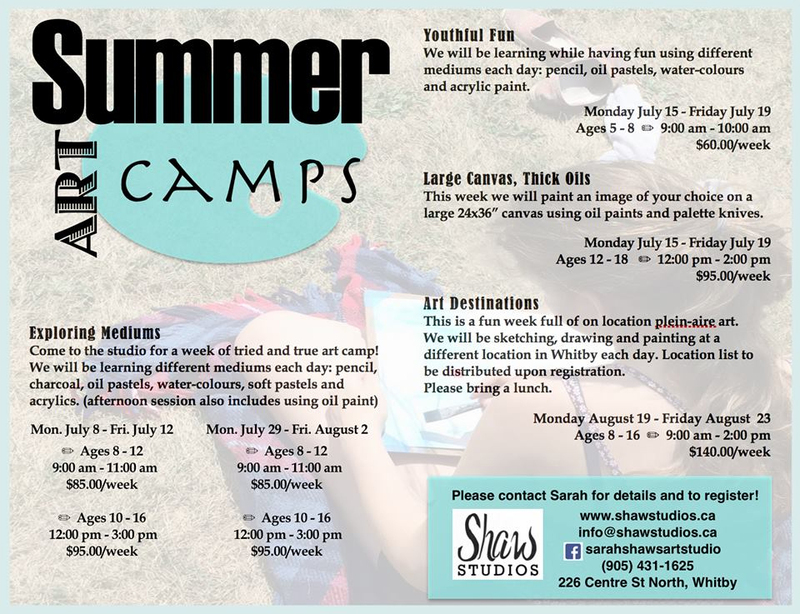 Sarah Shaw runs a home based art studio offering weekly art lessons to children (ages 6 and up) and adults in all mediums. She also offers special events, birthday parties, adult painting parties, commissioned artwork and more! Offering 6-week classes in musical theatre, acting, improv, dance and drumming. Monday night, Uninstructed Life Drawing on October 22nd. Registration is required. Please call 298-991-1067 for more details. Don Short for artist-directed, art-making workshops that will motivate, inspire and inform! Cavan Art Gallery and Academy would like to invite artists, friends and relatives to visit the gallery and to enjoy the art of local artists. Three excellent galleries within an 8-minute drive. Great excursion with two cafes available. Laughter and good times are coming up in the Third Session of the France Art Retreat May 2020 in the Dordogne in France 2019 and it is now time to book and discover the perfect place for your painting holiday. The village is Terrasson Lavilledieu, as pretty a place as you can find. We will stay for ten days in a beautifully renovated home. We will paint the life around us, enjoy lovely lunches and go to the outdoor markets. We will have a chef prepare a meal for us at the residence, go to see the cave paintings, and partake of a meal at a fine winery. Painters of all levels are encouraged to join, including beginners. Town of Richmond Hill Pour Your Heart Out acrylic pouring workshop. Sunday May 12th from 9:00 to 4:30. You will be doing one black canvas One in am and one in pm, Including a boat painting. 9:00 to 4:30. Step by Step class walk you through the painting below. Learn Mixing colours, key elements in the reference. Continued personal support. Two sessions left at Trent University Acrylic and Watercolour ~ Wednesday and Fridays 7 to 9 p.m.
dates: May 7, 14, June 25 for Francophones and Francophiles. Please register at 905 571 0826 or info.acfodp@gmail.com Both Acrylic and Watercolour are available. Loose and Lively Plein Air Watercolour Landscape Monday to Friday -July 15th to July 19th. Pour Your Heart Out Saturday July 27th. Summer Arts. If you are a PineRidge Arts Council member and offer lesson packages and workshops, you are welcome to have it posted here. Just let us know.